Subtitle: The really big plan may be to set the stage for international conference where participants may take the "leap of faith" necessary to declare that these violent storms are proof of "Global Warming" so the radical environmental plans may be enacted. Prince Charles seems to have laid the "mystical spiritual" groundwork last week. "Twenty-three-foot waves crashed ashore in Jamaica, a wave of panic buying swept Havana and the Florida Keys depopulated itself Friday -- the residents of three diverse nations terrified by a ferocious Hurricane Ivan ... Ivan slammed coastal areas late Friday night, heading for a direct hit on the island. Its winds strengthened to nearly 155 mph -- the most powerful Category 5 ranking -- as the storm's center moved toward landfall ... Even before the arrival in Jamaica of Ivan's catastrophic eye wall, overflowing rivers washed away homes; waist-high water flooded neighborhood; and the Hilton in New Kingston barricaded guests behind doors covered with plywood ... Ivan's rampage across tiny Grenada earlier this week left at least 17 dead and the island nation of fewer than 100,000 people in ruin. The State Department decided to use charter flights today to begin evacuating U.S. citizens." With stories like this abounding, it was no wonder that American citizens -- particularly Floridians -- were extremely concerned. For many days, forecasters showed that Ivan was going to make landfall either in Miami or somewhere along the Western coast of Florida. Many citizens who had just returned from Frances suddenly left the state again to avoid Ivan. Suddenly, Ivan began drifting Westward, against all prognostications. Each day it drifted more Westward, until suddenly people from the Florida Panhandle to New Orleans began to be worried. Let us pick the story up at this point. "PENSACOLA, Fla. (AP) - Rather than roll the dice on where 160-mph Hurricane Ivan might strike, Gulf Coast residents from Florida's Panhandle all the way to the bayous of Louisiana spent Monday boarding up their houses, tying up their boats and making plans to evacuate ... A hurricane watch was issued late Monday for 420 miles of the northern Gulf of Mexico from Morgan City, La., to St. Marks in the Florida Panhandle. The watch, which includes the greater New Orleans area, means hurricane conditions are possible within 36 hours ... Emergency officials in several Panhandle counties began issuing evacuation orders Monday for all those living in mobile homes, barrier islands and storm surge areas. In Escambia County, which includes Pensacola , that order affects 130,000 homes. Earlier, military bases in the region flew out some 275 aircraft, and oil and natural gas companies began evacuating hundreds of workers from offshore rigs in the eastern Gulf of Mexico. In New Orleans, a city largely below sea level and extremely vulnerable to hurricanes, Mayor Ray Nagin urged anyone who could leave to get out as soon as possible. The city and its environs are home to about 1 million people." Cars leaving New Orleans were reportedly bumper-to-bumper in a line stretching to the Texas border. After some delay, officials opened the freeways normally flowing into the city so that the traffic flow was completely out of the city. Stories abounded that were very frightening. Let us examine one of those stories now. "The computer models show a hurricane with a wind speed of around 120 mph or more hitting just west of New Orleans would push a storm surge over the city's levees. Ivan had sustained winds of 140 mph Tuesday. New Orleans would be under about 20 feet of water, higher than the roofs of many of the city's homes ... Much of the city would be under water for weeks ... If the eye came ashore east of the city, van Heerden said, New Orleans likely would not have catastrophic flooding." The most important fact of this IndyStar article was the last sentence: "If the eye came ashore east of the city .... New Orleans likely would not have catastrophic flooding." I was most interested in this fact, because I had one eye on the "Simulated Reserve and Corridor System To Protect Biodiversity" map, shown below. This map clearly indicates that New Orleans is one of those areas in which human activity would be allowed once this draconian system is implemented. Therefore, it made no sense that Hurricane Ivan would make landfall West of the city. This fact reinforced the reality that the winds to the east of the eye are much more powerful than the winds to the west of the eye. Keep this in mind, for we shall return to this fact later in this article. [NOTE: These three maps are very important in your understanding, so please allow us to take a moment to explain them. 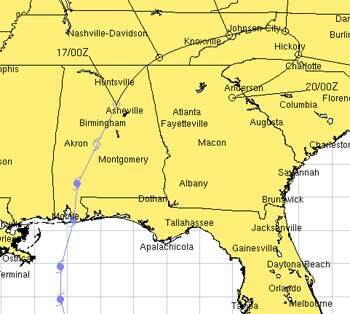 The first map on the left is an actual map tracking the eye of Ivan from where it made landfall to the time when it faltered and died in the northern section of South Carolina; this map is from the Naval Research Laboratory web site (http://www.nrlmry.navy.mil/). The map to the right is the identical section of the country taken from the "Simulated Reserve and Corridor System (Re-Wilding) Map To Protect Biodiversity. (NEWS1368 and NEWS1958). On this map, the red areas are called, "Core Reserves & Corridors: Little To No Human Use" while the yellow areas are "Buffer Zones: Highly Regulated Use". 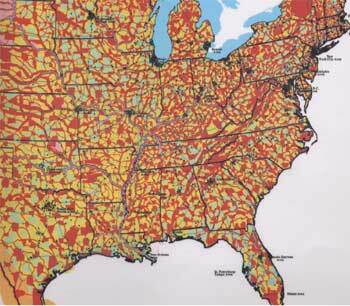 As we explain in NEWS1368, no human will be allowed to live in the Red Zones while the Buffer Zones in Yellow will be so tightly regulated that virtually no humans will live there, either. The only two areas on the map in which humans will be allowed to live and work are the Light Green, "Normal Use" areas, and the black dots which represent cities of 10,000 or more. Note in this largely depopulated map, no cities will be extremely large! This reality seems to suggest that the final implementation of this plan will not occur until the 66% population reduction plan has been carried out. The third map, to to your immediate left, is a combination of the two maps. i.e., the actual Ivan tracking Naval map is overlaid on top of the Reserve Corridor map. This map is especially valuable to our understanding because you can see the actual tracking of Ivan's eye on top of the Biodiversity Map. You will be able to see that this map did track uniquely along and around Red and Yellow zones. Ivan finally made landfall, as a weakened Category 5 hurricane, early in the morning of Thursday, September 16. "GULF SHORES, Ala. — Hurricane Ivan hurtled through Alabama early Thursday, its fierce winds splitting bridges into pieces and its blinding rains turning roadways into lakes, before weakening to a tropical storm by afternoon and swirling through Georgia ... By late afternoon, Tropical Storm Ivan was rolling into northern Georgia and the Atlanta region ... Ivan quickly deteriorated to a tropical storm after coming ashore. But forecasters warned it was not done yet: It threatened up to 15 inches of rain and flooding across the South, already soggy after Hurricanes Charley and Frances over the past month ... For Florida, it was the third storm in five weeks. Hurricane Charley struck the state Aug. 13 and Frances on Sept. 5..."
" 'Ivan was nowhere near as bad as Frederic — not even close', Mobile Police Chief Sam Cochran said, referring to the 1979 storm that devastated the Alabama coast. 'I think we were really spared and blessed'. New Orleans, especially vulnerable to storms because much of it lies below sea level, had wind and just a touch of rain. 'Leaves in the pool — that's it', said Shane Eschete, assistant general manager of the Inn on Bourbon Street ... A tropical storm warning remained in effect from the mouth of the Pearl River in eastern Louisiana to Apalachicola, Fla. National Hurricane Center forecasters said land east of where Ivan's eye passed would experience storm surge of 10 to 16 feet, topped by large and dangerous battering waves ... The National Weather Service issued a flood watch for as far away as North Carolina..."
Let us stop right here to refer back to our maps, above. Hurricane Ivan stretched from just East of New Orleans to Apalachicola, Florida - a span of nearly 300 miles. Notice on the Naval Military map where Apalachicola is located; then, find that spot on the "Core Reserves & Corridors" map. You will discover that Apalachicola, Florida, is located right where a significant red spot is depicted on the Florida panhandle. Just before leaving for Wednesday evening prayer service, my wife and I watched the Weather Channel, where it was reported that the highest waves the storm had to deliver were going to hit Apalachicola. Of course, the reason the winds and waves were the worst at Apalachicola is because that location was to the East of the hurricane's eye, where the worst winds and waves are always present. Further, note that most of the area all the way along the nearly 300 miles where Ivan struck landfall is colored either Red (No human activity allowed) or Yellow (Highly Regulated Zone). Thus, the storm blasted an area nearly completely covered over with Red and Yellow markings, denoting little or no human activity to be allowed in the future dreadful state planned for all of us. Now, let us note the path of the eye of Ivan as it progressed northeast from the coast, looking first at the Naval map and then proceeding to the overlaid map. You will notice something very interesting: the eye of the storm follows a rather thin red line on the map, running north-east from just West of Mobile to the northeast corner of Alabama - Georgia. Since the winds and floods extended 150-175 miles from the eye in all directions, a great deal of the Red and Yellow areas on this map were seriously impacted. Further, note that, at the border of Alabama - Georgia, the color changes from Red to Yellow, so the eye is still tracking along the Red/Yellow track. Now, look as the eye moves into Tennessee at the border of Western North Carolina. Looking first at the Naval Military map, you will see that the eye passed over Knoxville and then Johnson City, Tennessee, both of which are right close to the North Carolina border. Remember, the area to the East of the storm's eye receives the greatest wallop from winds and flooding rain. Therefore, the very large Red and Yellow area virtually filling the Southwestern corner of North Carolina took the brunt of the Eastern side's winds and flooding rains. Notice that the eye traced around the Red and Yellow area on that map bracketed on the East by Hickory. The eye then headed south and west as it seemed to follow the large Red/Yellow area in that corner of North Carolina. Therefore, this storm seemed to follow a specific path of Red/Yellow areas as it maneuvered to the north-northeast, finally maneuvering right around the very large Red/Yellow area in the corner of Western North Carolina. Flooding was enormous in this area, and northward all the way to southwestern Pennsylvania. Roads were cut, bridges were knocked out, power was disrupted to hundreds of thousands of people, and economic consequences were staggering. 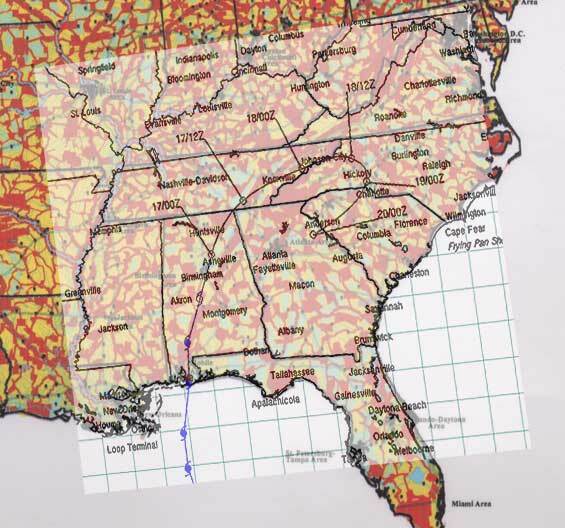 It seems clear that Hurricane Ivan was caused to hit Red/Yellow "No Human Use Zones", that it followed a path of such zones shown on the map running north-northeast to the Alabama-Georgia border and then tracked around the large Red/Yellow area of Western North Carolina, where virtually the entire section is planned to be emptied of people! Let us now examine some of the economic damage caused by Ivan. 1) They believe numbers contain inherent power. Therefore, an planned event has to be carried out "by the sacred numbers" of the occult, or the plan itself might fail. 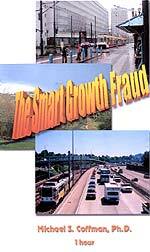 Even a well-conceived and executed plan may fail if it is not carried out by the "sacred occult numbers". The several favorite numbers to the occult are: a) '11' -- Number of the coming New Age Masonic Christ (Antichrist); b) '13' -- Number of extreme rebellion against God's constituted authority. (Read NEWS1756 for full details of events in history carried out "by the numbers". c) '3' -- the number of the Pagan Trinity (Satan, Antichrist, False Prophet). d) '5' - Number of death. Any of these numbers may be multiplied or repeated for greater emphasis. Thus, a "5" could be shown as a "55" (double death) or as a "555" (triple death). An "11" could be multiplied by any single number for special meaning; thus, an "11" could be multiplied by the pagan trinity number (3) to produce a favorite number , "33". Finally, a "13" could be multiplied by the same pagan trinity number to produce "39", the year in the 20th Century that Illuminist Adolf Hitler began World War II. 2) Occultists want to signal other occultists that the event which just occurred was part of the plan to produce their Antichrist -- a plan with whom all leaders of the world are currently obsessed. When other occultists throughout the world see that an event occurred "by the sacred numbers", they will know it was carried out by the Illuminati for the purpose of staging Antichrist. And most deliciously, the "profane" people of the world -- those not in the occult -- will have no idea what has just happened! When an event is carried out "by the sacred occult numbers", we say that it contained an Occult Signature". 2) Hurricane Charley struck on Friday, the 13th of August -- We do not feel like we have to educate you how important Friday, the 13th is to the occultist. 3) Hurricane Frances struck on September 5. If you begin counting the day before Frances hit (Sept 4), you have precisely 22 days from the day Charley struck. If you include the first day the hurricane hit, the time spread between Charley and Frances was 23 days. As we stated above, Frances actually made landfall in the wee hours of September 5, only because it suddenly, inexplicably, slowed down from 13mph (http://www.iconx.com/forums/static/topic-3-19-694-0.html) to 8mph. (http://news.bbc.co.uk/2/hi/americas/3625252.stm). This may have been a mistake in maneuvering the storm. 4) Ivan struck in the wee morning hours of September 16. Nevertheless, the spread between Frances and Ivan was exactly 11 days - September 5 to 16. These 3 hurricanes seemed to have contained an "Occult Signature". As we state below, the purpose seems clearly to use this storms in such a manner as to allow the politicians of today the excuse to force the world into accepting the damaging Kyoto Accords in order to stave off "Global Warming". As we explain in our articles in the Weather Control section, Global Warming and "Sustainability" are the code words for dismantling this Industrial Civilization, the end result of which is represented by this "Simulated Reserve and Corridor System To Protect Biodiversity" map. We speak to this issue toward the end of this article. We expect that maybe the next G-8 Summit will seriously consider "Global Warming" and "Kyoto Accords", citing these horrific hurricanes and other violent storms throughout the world as all the "proof" they need. "HARMON DEN, N.C. -- ... The deaths of Forrester and her son brought the total attributed to Ivan in North Carolina to 10, making it the deadliest storm in western North Carolina since 11 died in 1977. Meanwhile, officials in Macon County were still trying to identify human remains found in the rubble of a landslide in southwestern North Carolina ... So far, three people have been confirmed dead in Peeks Creek ... The storm also killed two men in Buncombe County, a man in Henderson County and women in Haywood and Yancey counties." A check on the location of Peeks Creek, NC, shows that this small town is located right in this Red area of Southwestern North Carolina. A check with a North Carolina county map (http://county-map.digital-topo-maps.com/north-carolina.shtml) shows that the fatalities mentioned in this news story, above, were located in counties which were also located in the Southwestern portion of North Carolina, right where the restrictive Red and Yellow areas are so prominent. "LINVILLE, N.C. – ... In a way, her rescue is an analogy for Appalachia's weekend struggle against the biggest floods in 64 years ... with casualties and damages still mounting, the back-to-back Frances and Ivan floods have reminded inland residents in several states that hurricanes can spread their devastation far beyond the surf-wracked shoreline ... The last time the waters came this high - 20 feet above flood stage at some levels - was in 1940 ... Near Franklin, a 100-foot-wide slash of Fishhawk Mountain came sliding down, destroying more than 20 homes and killing at least three people. Ten were still missing Sunday morning, and the floods went down as the worst disaster in Macon County history ... One father and his two kids tried to drive across a boulder as the Watauga River rose, and were temporarily stranded in their car ... "
"As the Ohio river rose, West Virginia was in a state of crisis ... Flooding and mudslides blocked 207 roads and damaged hundreds of houses in the state. The National Weather Service predicted the river would crest on Sunday at 46 feet - close to its record ... But all told, western North Carolina had more fatalities per capita than anywhere else, and the region was hit harder than most expected." Did you catch that last sentence? "western North Carolina had more fatalities per capita than anywhere else, and the region was hit harder than most expected." The area of which this sentence is speaking is that large Red/Yellow area in the Southwestern corner of North Carolina, an area marked out for "little to no human habitation" -- where no human beings will be allowed to live, work, or recreate in the coming New World Order. "PUNTA GORDA, Fla. (AP) - Rescuers rummaged through a chaotic landscape of pulverized homes and twisted metal Saturday, racing to tally Hurricane Charley's "significant loss of life" and help thousands left homeless by its vicious winds and rain ... emergency officials pronounced it the worst to wallop the state since Hurricane Andrew tore through in 1992 ... 'Our worst fears have come true', said Gov. Jeb Bush, who surveyed the devastation by helicopter. The Category 4 storm was expected to cost Florida "at least several billion dollars," said Loretta Worters, spokeswoman for the Insurance Information Institute ... 'thousands upon thousands of people' lost their homes. Hundreds were unaccounted for in the county, which includes Punta Gorda and Port Charlotte ..."
Many people are deciding to move elsewhere because of all this devastation. We have heard of many people trying to sell their homes, or walking away from their devastated property. One couple was quoted in this story as saying they were going to leave. "Among those seeking treatment was Marty Rietveld, showered with broken glass when the sliding glass door at his home was smashed by a neighbor's roof that blew off. Rietveld broke his leg, and his future son-in-law suffered a punctured leg artery. 'We are moving', said Rietveld's daughter, Stephanie Rioux. 'We are going out of state'." "1. Charley; 2) Frances; 3) Ivan; 4 Sale"
Every person who does move voluntarily makes it that much easier for authorities to implement this draconian map, where over 70% of America is to be set off limits to human habitation. Farmers seem to have been especially hard hit. Obviously, taking over valuable farming property so it could go back to its natural state is a valued aim in this plan. "MIAMI — While Hurricane Frances was far less damaging than feared, citrus crop damage may set records, Florida officials said Monday ... some citrus growers in and around Indian River County in central Florida were reporting 80% to 90% of oranges and grapefruit on the ground. Elsewhere, up to a foot of rain left citrus trees standing in water that could ruin remaining fruit and rot roots. 'We've never had a storm sit over the whole state and batter it like this before ', Bronson said. Intense, but smaller, Hurricane Charley three weeks ago is being blamed for up to $180 million in citrus damage. 'Frances could exceed that', he said ... Between the two storms, eight of Florida's 10 biggest citrus-producing counties — with more than 500,000 acres of groves — have been hit by damaging wind and rain ... The industry fears Frances had a particularly severe impact on grapefruit. About 75% of U.S. grapefruit supply comes from Florida." "NEWVILLE, Ala. (AP) - Alabama cotton and peanut growers could suffer catastrophic losses from the fierce winds and torrential rain of Hurricane Ivan ... Farmers have already started harvesting Alabama's $120 million peanut crop and its $300 million cotton crop, but the majority of the crops remain in the field, vulnerable to such wind and rain. Ivan was expected to make landfall early Thursday as a major hurricane, with hurricane force winds extending for about 100 miles inland ... 'This particular storm could not have come at a worse time for peanuts," said Dallas L. Hartzog, a peanut specialist with the Alabama Cooperative Extension System. Hartzog estimated that only 10 percent of the crop has been harvested.
" 'I expect Ivan to be catastrophic', said William C. Birdsong, an Extension System cotton specialist ... Alabama growers have about 200,000 acres of peanuts and about 600,000 acres of cotton this year ... Peanuts are vulnerable because many are still in the ground. Excessive moisture increases disease risks and could cause some to fall off the plant. The loss of those peanuts would reduce yields ... Cotton is at risk because many of the bolls have opened, exposing the white fluff that reigns as the world's most popular natural fiber. High wind can blow the fiber to the ground, where it can't be harvested. Wind can also tangle the plants, making cotton difficult to pick. Excessive rain this time of year tends to degrade the fiber, making it less valuable. Last year, cotton growers had average yields of between 1,000 and 1,500 pounds per acre. This year they were expecting 750 pounds per acre ... every cotton farmer in the state will receive significant damage." If the overall plan is to force people out of these Red and Yellow areas on this Biodiversity (Re-Wilding) Map, these three hurricanes in about 33 days delivered a heavy punch. People were blown out, or were discouraged thinking they were living in an area too often afflicted with such storms, or were washed out. The economic devastation was horrendous; only the passage of time will tell how horrendous and how many people are actually able to rebuild. In the aftermath of Hurricane Isabelle last year, people are still having trouble getting state approval to rebuild, or they are being offered only a fraction of the replacement cost of their property. A subscriber who owns his own construction company in the area Isabelle devastated has recently told me that many people have left. During these past years, Americans have gotten too used to seeing FEMA agents on the scene, benevolently helping victims get back on their feet. Additionally, numerous TV shows and movies have depicted FEMA in the same good light. However, when you examine the purpose of FEMA, you will see that the true face of this organization will be completely different when the planned panics actually hit this country. These hurricanes enabled FEMA to strengthen. "WASHINGTON — Three major hurricanes in just over a month have strained the resources and staffing at the government's disaster relief agency, the director of preparedness said Wednesday. 'The agency is stretched to the limit. There's no question about it', said David Paulison of the Federal Emergency Management Agency (search). 'This is one disaster after another' ... FEMA still has about 5,000 people in Florida helping with recovery efforts from hurricanes Charley and Frances. Some of those workers will assist with the aftermath of Hurricane Ivan ... FEMA will hire local workers as well. The agency hired and trained about 1,800 people for community relations assistance with Charley and Frances. The government is prepared to move in some 600 refrigerated trucks of ice and water. An additional 17 trailers were heading to Mississippi with generators, cots, blankets, home repair kits and other supplies. President Bush asked Congress for $3.1 billion on Tuesday to help Florida and other states affected by the earlier hurricanes. Bush said he would seek additional aid later." Victims by many thousands have come to look kindly upon FEMA because of their efforts and have told their neighbors how helpful they have been (there are exceptions, of course). But, when the time come for the planned panics to hit, FEMA will assume her dictatorial face. "Hurricane Ivan is among the most powerful Atlantic storms in recent history, and more such storms are likely in the future due to global warming, say climate experts. 'Global warming is creating conditions that (are) more favorable for hurricanes to develop and be more severe', said Kevin Trenberth, head of the climate analysis section at the National Center for Atmospheric Research in Boulder, Colorado ... there is little debate that the Earth is retaining more of the sun's energy than in the past. Emissions of gases such as carbon dioxide act as an extra blanket that keeps some of the sun's energy from dissipating into space. The extra energy from this "greenhouse effect" has already warmed the Earth by about 1 degree Fahrenheit, according to the 2001 report by the Intergovernmental Panel on Climate Change. The report is based on evidence and research from more than 2,500 scientists from about 100 countries. "Hurricanes need warm water, and the oceans are heating up, as evidenced by the 1 1/4-inch rise in global sea levels over the past 10 years, said Trenberth. The additional heat is causing most of this sea level rise because of thermal expansion -- just as a very full pot of water heated on a stove will spill over ... the hurricane-producing mid-Atlantic and Caribbean oceans are warmer and, most important, there is more water vapor in the air. Water vapor or moisture in the air is the high-octane fuel of hurricanes. Oceans need to be 80 degrees Fahrenheit or more to produce enough water vapor for a hurricane to get started. New research by Trenberth's group has found that water-vapor levels are now 15 percent higher on average in the hurricane zone than they were 20 or 30 years ago ... global warming is greatly increasing the odds in favor of more intense and more frequent hurricanes and cyclones, Battisti said. Where these storms will appear is very difficult to predict. Traditional hurricane zones may not see any increase while countries that have never experienced them will, he said. Brazil was struck by the first-ever hurricane in the south Atlantic last March, while the Atlantic coast of Canada got smacked by the storm of the century, Hurricane Juan, late last year. While these may be flukes, the Canadian government suspects global warming and is worried about the future." Right on cue, "experts" come out of the woodwork to tell us that Global Warming is to blame for these terrible increase in storms. The occult teaching must be understood here. Occults teach that this planet is a living, breathing goddess, whom they have named Gaia. Mother Gaia (Mother Earth, Mother Nature) is overloaded with the tremendous stresses and strains put on her by our current Industrial Civilization. We consume too much of her irreplaceable resources, we pollute her waters and lakes with our chemicals, and we foul her air with our discharges. Mother Earth must correct this pressure or she will die, taking all mankind with her. Devastating storms are Mother Gaia's effort to cleanse herself and correct the imbalance brought on by man's activities. If one storm does not correct the imbalance, Mother Gaia sends another, and then another and then another. She also will send more devastating, powerful storms than the previous ones if mankind does not get the message. This is the storyline behind the movie "Day After Tomorrow" (NEWS1924). In this troika of hurricanes, Ivan was the most powerful, just as an occultist might plan it. Let us return to our current feature article to see how its author moves beyond talking just about hurricanes, moving to other types of devastating storms as examples of storms created by "Global Warming" (Global Warming is, itself, one prime example of the imbalances our civilization is causing Mother Gaia). Immediately, the real scientists ride forth to try to debunk this environmental propaganda. "(CNSNews.com) - The recent onslaught of hurricanes has prompted some media outlets to mention "global warming" as a possible cause, but a team of climate researchers set the record straight. A group of climatologists, scientists, professors and other experts in climate change on Tuesday pointed out two 'misconceptions' reported in the press about hurricanes and their relation to climate change, in a letter to Sen. John McCain (R-Ariz.), who chaired a Commerce Committee hearing examining recent scientific research concerning climate change impacts. "First is the erroneous claim that hurricane intensity or frequency has risen significantly in recent decades in response to the warming trend seen in surface temperature. Second is the claim that a future surface warming trend would lead to more frequent and stronger storms. We believe that both of these are demonstrably false', the scientists wrote. They noted the National Hurricane Center reports in the last century the decade with the largest number of hurricanes to hit the U.S. was the 1940s, and the frequency of hurricanes has gone down since then. According to the United Nations Environment Programme of the World Meteorological Organization, 'Reliable data ... since the 1940s indicate that the peak strength of the strongest hurricanes has not changed, and the mean maximum intensity of all hurricanes has decreased'." "The second claim in news stories about hurricanes and 'global warming', they pointed out, involves the question 'if surface warming trends continue, are more or fewer severe storms likely?' Computer simulations suggest that in a warmer world most of the warming would occur in the Polar Regions. Atmospheric circulation, which crucially affects storms, is driven primarily by the temperature difference, or gradient, between the tropics and the poles," the experts wrote. 'Warmer polar regions would reduce this gradient and thus lessen the overall intensity or frequency or both of storms - not just tropical storms but mid-latitude winter storms as well (such as blizzards and northeasters)', the climatologists added." Thus, watch for government agencies to trumpet "Global Warming" so many times that people will forget that occasional correct science article. Watch for non-government agencies whose funding totally depends upon Federal Government generosity to likewise keep up the drumbeat. Several years ago, Prince Charles showed the whole world the basis upon which the bridge will be made from real scientific facts to the make-believe world of "Sustainability". When a person is confronted with scientific facts disproving his belief, what does a person in this coming New World Order do? "Last week the BBC took the unprecedented decision of inviting Prince Charles to deliver one of its prestigious Reith lectures ... 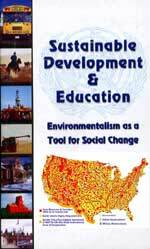 The overarching theme of the lectures was 'Respect for the Earth, Can Sustainable Development be Made to Work in the Real World?' ... 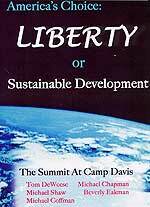 In his lecture he argued that 'sustainable development' meant abandoning science in favor of mysticism. 'It is only recently that this [religious] guiding principle has become smothered by almost impenetrable layers of scientific rationalism', he declared. 'I believe that if we are to achieve genuinely sustainable development, we will first have to rediscover, or re-acknowledge a sense of the sacred in our dealings with the natural world, and with each other'. ... The views expressed by Charles in his talk are not new. In 1996 he accused science of trying to establish a 'tyranny over our understanding' ..."
Once you understand Black Magick Witchcraft, this definition of the religion of Antichrist makes sense. Consider the key words which provide understanding. "King of fierce countenance -- A practicing shaman or witch is so thoroughly and powerfully demon possessed that their visage changes, at least when they are "in the spirit". When they are actually performing a ritual, they assume an extremely mean and nasty look. Adolf Hitler was the perfect picture of such a "King of Fierce Countenance" as he broods outwardly to the world. * Understanding dark sentences -- When a witch properly performs a ritual, he or she has to do so exactly, getting every word and every nuance correctly. This skill is known as "understanding sentences". However, a "dark sentence" is a ritual performed by a Black Magick witch for the purpose of doing harm to an individual or to mankind. Thus, we know that Antichrist is foretold to practice Black Magick Witchcraft, not White Magic. * His power shall be mighty, but not by his own power -- A witch does control great power, but it is not his power. It is the power from Satan out of the Abyss itself. Antichrist will be able to command the greatest power of Witchcraft in world history. * He shall destroy wonderfully -- The power of a Black Magick Witch is purposely called forth in order to destroy an enemy. This emphasis upon utilizing these powers to destroy is another indication that the witchcraft being performed is Black Magick. * Through his policy also he shall cause craft to prosper in his hand." -- The shortened word, "craft" has long been used instead of the longer, and more problematic, term "Witchcraft". "Being one more in addition to one or more of the same kind *have another piece of pie* "
Therefore, the kings of the End of the Age shall number ten and they shall be of the same "kind" or religion of Antichrist. The world was reorganized into precisely 10 super nations from 1992-1996, as NAFTA was Nation #1 in this plan (NEWS1002). Therefore, the leaders of these kingdoms are of the same religion as Antichrist. Since we know that the religion of Antichrist is foretold to be Black Magick Witchcraft, let us examine our current leader of NAFTA, President George W. Bush. We know that he is a lifelong Adept in a Black Magick secret society, Skull & Bones, the same type of "Brotherhood of Death" society in which Adolf Hitler received all his Witchcraft training. Furthermore, Democrat Candidate John Kerry is also an Adept in Skull & Bones. The End of the Age truly is drawing nigh, with all elements coming together at the same time. At the time we are seeing Israel separate her population from the Palestinians, we are also seeing the Iraqi war build into the kind of explosive spark which will drive the Muslims of the world into such fury they will declare war on the West. At the same time, we are seeing the prophesied Apostasy of the Christian Church as the global church of the False Prophet marches onward. We are seeing an implantable chip being marketed that fulfills the prophecy of the Mark of the Beast. We are seeing so many of the foretold events in our daily news that we must conclude these are the End Times. Remembering that the Illuminati Plan fulfills prophecy exactly, we are now seeing the groundwork laid for the ultimate worship of Mother Gaia, the "Re-Wilding" plan of this draconian "Simulated Reserve and Corridor System To Protect Biodiversity" map is such an integral part. All elements of this global Plan are now working toward a conclusion at the same time, just as any well-written plot would do.